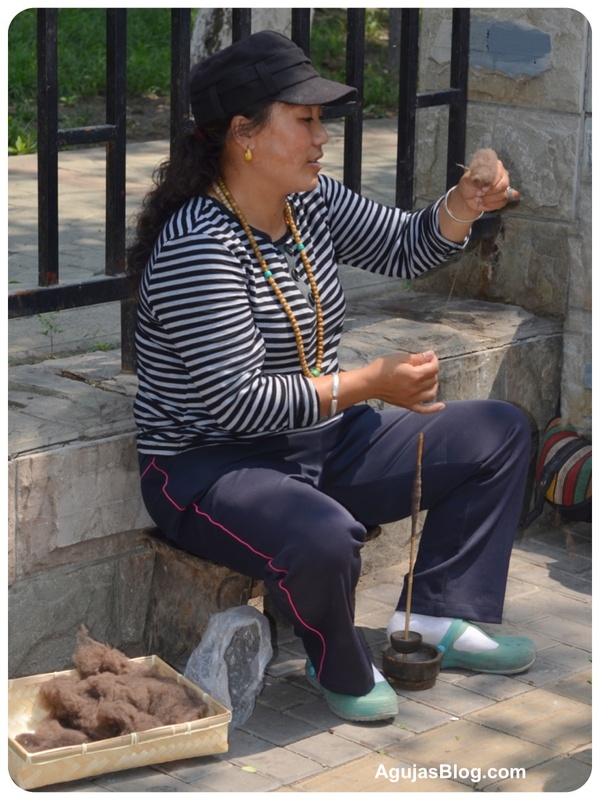 As I was walking towards the subway after a morning of haggling at Yashow Market, I saw this – a woman spinning wool! I asked her if the fiber was 新羊毛 (xīn yáng máo), the Chinese term for wool. She smiled and nodded. Her companion had a thick yellow thread or yarn on the floor beside her. As she talked, she continued working on what looked like a cross-stitch landscape. I may have to carry my WIP and a little stool with me so I can join these sidewalk sessions. The ladies allowed me to take a few photos. Even the baby peeked into the camera! So cool. Why don’t people in the US do this? We do. 🙂 I spin on a spindle that looks just like the one in the picture, and I do so in public. Regularly. Very cool. Ummm, I have walked and knitted, ridden on the back of a motorcycle and crocheted, but my spinning isn’t good enough for public viewing. I’m looking for a traveling spinning wheel for just this reason. I am impressed! On a motorcycle!! I get carsick if I knit on the road. Sigh. I was glad to actually get out and about instead of staring at my computer. She is getting such a thin thread! Wouldn’t you love to know what she intends to use it for? I should have asked, or rather tried to ask. Q – How wonderful! Shows that women are the same no matter where! I agree. Even with the language barrier, I elicited smiles and common understanding when I motioned to them that I knew how to spin. It was great. I agree with Curls: women are women, wherever they are! Just lovely. I did find a Beijing Guild. From the website, looks like mostly expats but it would be interesting to meet women from all over who are united by knitting. yes, lots to learn from each other. That’s wonderful. I love taking my projects out and about. You meet a lot of people that way, especially while spinning I’ve found. Most people just aren’t that used to seeing the drop spindle. More used to picturing a big wheel I guess. It is fascinating to watch! I take my knitting with me but not my spinning. These women inspired me to start! Great! It is so much fun sitting on a patio or in a park and just relaxing with your spinning. I use a wine bottle gift box to carry my spinning. It works well as long as you don’t have a wide one. OMG! I love this post! 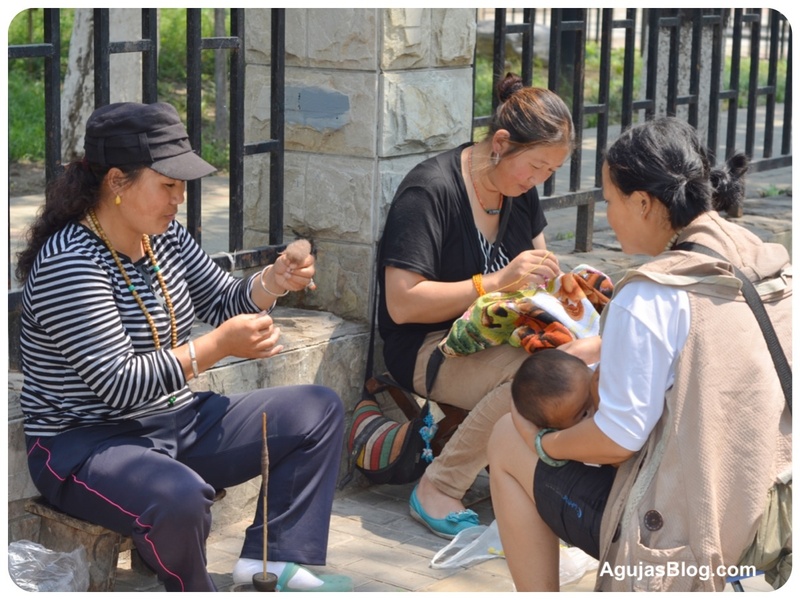 To think…women all over the world connected by these very simple activities of mommying and fiber crafts. What a lovely thing. I stopped in my tracks when I saw them. I wanted to sit and spin with them!